Reason #822 why I love technology. We finally set up our web cam and used it last week to talk to Brant, Heather and Ambrynn in Florida. It was kind of weird and will take some getting used to but it was pretty fun. After Ambrynn warmed up a bit she sang us some songs and told us about her Halloween. We were surprised at how long her hair has gotten and we were thrilled to hear her little voice. We miss them so much but we’re adjusting and they are happy there and that’s what really counts. One thing that really helps is Heather is very good about sending photos. 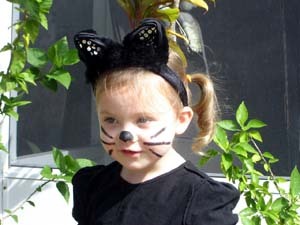 Like this one, of Ambrynn in her Halloween costume. Isn’t it nice to know that she’s just as cute as ever? She is a doll. The webcam is great idea! How cute! I enjoy hearing the “little voices” of children. It always gets my attention in a crowd. Technology can be a wonderful thing…I’m so glad you can SEE them, it does make a big difference! What an adorable kitty cat she made! Oh yeah. We far-flung families LOVE technology! Such a cute little kitty!! She’s the cutest kitty I’ve ever seen (and I’ve seen plenty)! Technology will help keep the bonds strong. Ambrynn is so cute! I’m glad to hear they’re happy. She’s just the cutest little thing. Webcam made a big difference when mine were in New England! I’m glad you got it set up! Awww, she’s so cute in her costume. Technology really is a fabulous thing. You know, some people say that technology is destroying our knack for human contact, but this totally disproves that! It must be such a relief to see their smiling faces. Very cool! What a great way to keep in touch. There’s something about being able to see and hear a person at the same time that makes one feel a little closer. Um, I think that would move right up to Reason #1. HOW FANTASTIC! And isn’t she adorable??? Seriously, just the cutest little kitty girl ever! don’t you love it when they sing their little songs? YEAH for Webcams! It must have been so wonderful to see them, but it must have been a bit painful too. Even 5 years ago you wouldn’t have been able to connect like that, well without spending thousands of $$ anyway! So yes, technonlgy ROCKS! Yes she’s quite a cutie! Really, there ARE some wonderful things about technology. I will try to remember this the next time I have ISSUES with my computer and/or steno machine! Ambryn is so adorable, just a doll. The webcam sounds like a great way to keep in toch and feel like you’re closer than just a telephone call or email. I’m so happy you got to see them live! Very glad you got the webcam. She’s adorable! YAY!!! She looks wonderful, healthy and happy. It’s bittersweet, but it will tide you over until the next visit. that’s great!! she is really adorable. my brother sends me videos of my niece and many pictures as well. i’m not sure if she’d get the video chat yet, but we could try it. Yep, still a cutie! 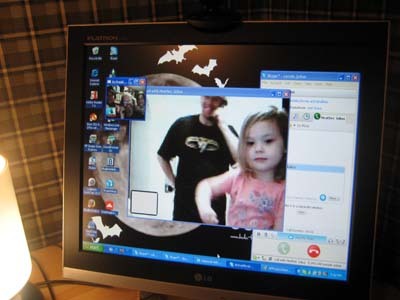 The webcam is a great idea and looks fun.